oh my! Do those women know how to cook! 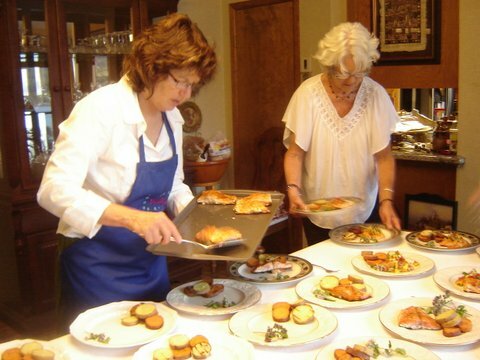 Cathy prepared an amazing dinner with delicious appetizers and grilled salmon topped with an awesome homemade salsa. 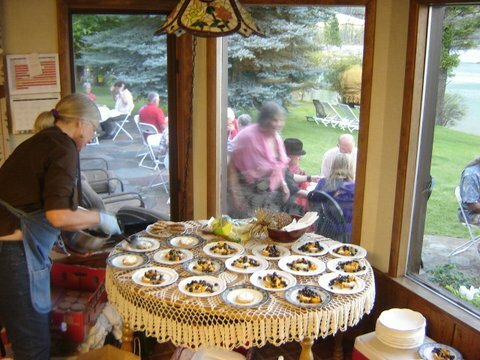 Dianne showed up with her lovely desserts – refreshing fruit piled on almond tarts she had made from scratch. The guests who attended this event to support the Historical Village not only had wonderful food, but a sunset on Dickey Lake and the sweet jazzy sounds of live music to round out their feast. I thought that this must have been the perfect way to contribute to a good cause. You get to sit there by the lake, listening to an intimate concert while being served an amazing dinner. And even though I was working the event (as a fairly uncoordinated waitress), I still appreciated the moment: the women and men who put in effort to make such a meal, the hosts who opened their home for the occasion and found those great musicians, and the people who were willing to write a check to help keep the Historic Village going. We were pleased with the money raised at this event. Is it enough to cover the new roof and paint job on the school house? No. But it was an opportunity for people to work together and eat together and talk and appreciate what community means. And as we sat around afterwards, I realized that it is another seed. We plant these seeds all the time to get people thinking about community, about how we are all connected, and how we each need to pitch in where we can.